For every pound you spend at Battleﬁeld 1403 – in the Farmshop or Sparrows Café – you will earn 1 reward point. 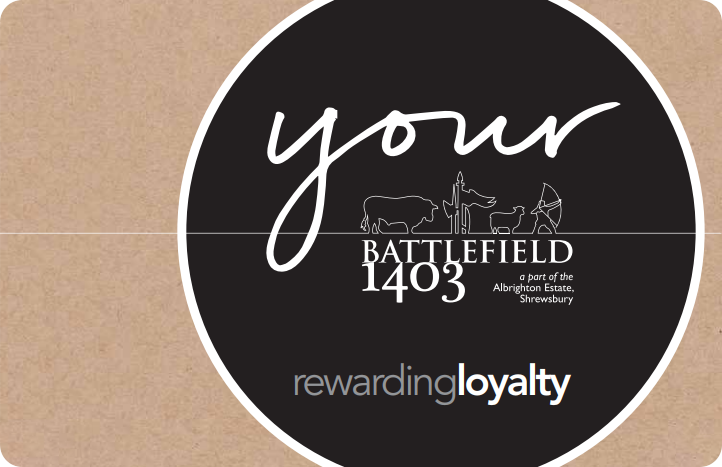 Battleﬁeld 1403 ‘Rewarding Loyalty’ Points can be redeemed against spend on most* products in Battleﬁeld Farm Shop or Sparrows Café. *National Giftcards / stamps are excluded. By signing up for our Rewards card you agree to receive email communications from us. You can unsubscribe from these at any time by clicking on the link in any of our emails. The Reward Card remains the property of Battlefield 1403 at all times and Battlefield 1403 reserves the right to withdraw, alter or suspend the Reward Card scheme at any time, including the scheme terms and conditions, and any Reward Points, promotions and offers without notice. You should check online here for the full terms and conditions and for any changes to these terms. If you use your Reward Card after any such change you will be deemed to have accepted the relevant changes. Your Reward Card can be collected in store, within a month of your application. PLEASE NOTE We do not post outside of the UK. All cards will be available to collect from our Farm Shop.